Yoplait Greek 100, Liberté Greek and Liberté Méditerranée are now OK Kosher Certified. Greek 100, Yoplait’s hottest product in decades, appeals to health conscious consumers and those who enjoy its thick texture. The recently released blended Yoplait Greek 100 was conceived after Yoplait saw the Greek yogurt market was missing a “great taste experience”, said Liza Dopp, Yoplait Greek marketing manager, so Yoplait developed their new offering with great taste in mind. As soon as Yoplait conceived the new product idea, they were in touch with OK Kosher to make sure all stages of product development were in line with kosher requirements. Yoplait’s proprietary blend of slow-fermenting cultures and real fruit pieces blended in creates a product with superior taste, high protein and the delicious creaminess consumers expect from Greek yogurt. Yoplait Greek 100 is available in plain and seven unique flavors including Blueberry, Strawberry-Raspberry, Strawberry-Banana, Tangerine, Coconut, Pineapple, and Vanilla. Each variety is made using simple ingredients – natural colors, flavors and sweeteners – and real pieces of fruit. Each 5.3 ounce serving provides 100% more protein than regular yogurt, 150 calories or less per serving, and 0% fat. Yoplait Greek 100 is also the only Greek yogurt endorsed by Weight Watchers and has a PointsPlus value of 2 per serving. Liberté Méditerranée is a high protein yogurt made with whole milk, cream and blended fruit. It contains live active cultures and does not contain any gelatin, sugar substitutes or preservatives. Liberté Méditerranée is available in seven flavors – Blackberry, Blueberry, Coconut, French Vanilla, Lemon, Peach & Passion Fruit and Strawberry. Liberté Greek is a high protein, fat free Greek yogurt made with real blended fruit. Liberté Greek currently has five kosher certified varieties – plain, Blueberry, Lemon, Peach & Passion Fruit and Strawberry. Greek yogurt itself is now a booming industry, encompassing around 40% of all yogurt sales currently compared to just 2% six years ago. Yoplait and its parent company, General Mills, understand that consumers look for the kosher symbol when purchasing groceries. From those who are health conscious, to those who observe kosher dietary laws as part of their religious observance, kosher consumers are a significant market force. 12,250,000 Americans intentionally buy kosher products and the kosher market experiences an average of 15% annual growth. 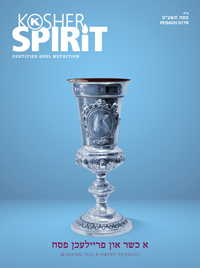 For over 70 years, OK Kosher Certification has provided the highest level of kosher supervision and customer service to our clients and kosher consumers worldwide. The OK certifies over 300,000 products in 90 different countries, from Fortune 500 companies to young startups. The OK symbol is universally accepted by all kosher certification agencies and clients who choose the OK know that the OK symbol provides significant added value to their products. Yoplait Greek yogurts are available nationwide and proudly bears the OK Kosher symbol on the package. Yoplait Greek yogurts – 100% more protein and now 100% kosher. We are pleased to announce that our new website has officially launched. We have completely redesigned our layout with simplicity, ease of use, and a strong focus on kosher information. The new website features three distinct sections, targeting the kosher consumer, the industry professional and the mashgiach with useful information and insights. At OK Kosher we believe that kosher advancement is never truly complete, and we will constantly undertake new and greater goals. Our new website will become the launching point for many exciting new features we will be rolling out in both the near and distant future to help you grow your OK Kosher program. We truly hope you will enjoy exploring our new website, and please send us comments and feedback to service@ok.org.